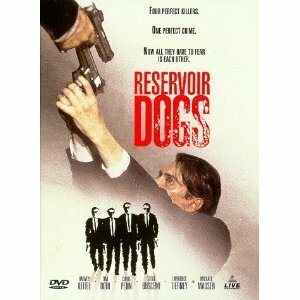 Reservoir Dogs-DvD starring Harvey Keitel, Steve Buscemi, Tim Roth, Chris Penn, Michael Madsen. Quentin Tarantino came out of nowhere (i.e., a video store in Manhattan Beach, California) and turned Hollywood on its ear in 1992 with his explosive first feature, Reservoir Dogs. Like Tarantino's mainstream breakthrough Pulp Fiction, Reservoir Dogs has an unconventional structure, cleverly shuffling back and forth in time to reveal details about the characters, experienced criminals who know next to nothing about each other. Joe (Lawrence Tierney) has assembled them to pull off a simple heist, and has gruffly assigned them color-coded aliases (Mr. Orange, Mr. Pink, Mr. White) to conceal their identities from being known even to each other. But something has gone wrong, and the plan has blown up in their faces. One by one, the surviving robbers find their way back to their prearranged warehouse hideout. There, they try to piece together the chronology of this bloody fiasco--and to identify the traitor among them who tipped off the police. Pressure mounts, blood flows, accusations and bullets fly. In the combustible atmosphere these men are forced to confront life-and-death questions of trust, loyalty, professionalism, deception, and betrayal. As many critics have observed, it is a movie about "honor among thieves" (just as Pulp Fiction is about redemption, and Jackie Brown is about survival). Along with everything else, the movie provides a showcase for a terrific ensemble of actors: Harvey Keitel, Tim Roth, Steve Buscemi, Michael Madsen, Christopher Penn, and Tarantino himself, offering a fervent dissection of Madonna's "Like a Virgin" over breakfast. Reservoir Dogs is violent (though the violence is implied rather than explicit), clever, gabby, harrowing, funny, suspenseful, and even--in the end--unexpectedly moving. Vogue Magazine-Gwen Stefani Cover 04/2004.